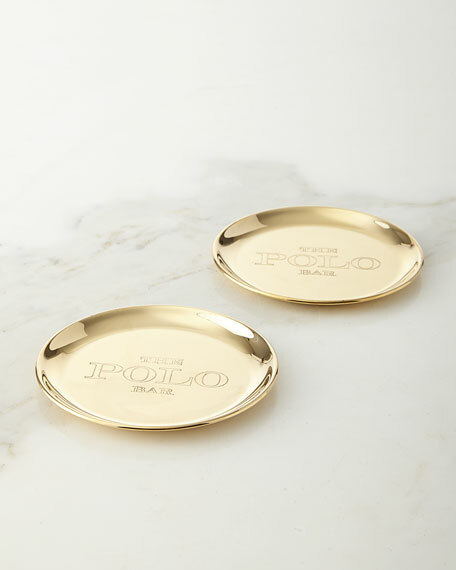 Coasters designed for the Polo Bar. Set of two; each, approximately 4.25"Dia. Engraved with "The Polo Bar." A black and gold play on French fifties faces. Handcrafted of high-fired porcelain with gilt details. Hand-painted finish. Hand wash.
A black and gold play on French fifties faces. Handcrafted of high-fired porcelain with gilt details. Hand-painted finish. Hand wash. Set of four includes one of each design shown; each, 4"Dia. Imported. Handcrafted coasters. Signature Courtly Check print on hardboard. Backed with cork; lacquered finish for heat and stain resistance. Set of four; each, 4"Sq. Due to handcrafting, placemats and coasters may vary. Wipe clean; do not submerge in water. Imported. Handcrafted set of four coasters. Acacia wood base with heavy gauge hand-glazed and decorated steel plate. Hand-painted details. Each: 3.75"Dia.